The flavour of home grown garlic cannot be compared to store bought, which has been (usually) washed in chemical to prevent it from spoiling. 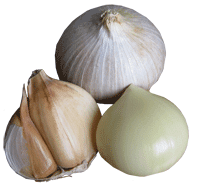 Some gardeners on the Coffs Coast prefer to grow the large Russian garlic or Elephant garlic however for first timers it might be a good idea to give all a go and see what works best for you. Firstly choose a very sunny area for your garlic. Good soil preparation is a vital key by using lots of old compost, blood and bone (if you don't have any roaming dogs!) and manure. What is required is a rich, friable, well-drained bed for your garlic. Plant the cloves (separated from the bulb). Select large, firm, free from mould, unblemished healthy knobs and only use the outer big cloves for planting - the smaller ones can be used for cooking. If possible, buy the garlic cloves from nurseries, organic growers or farmers markets - anywhere you have access to untreated cloves. 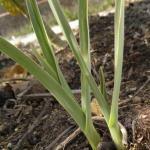 For the Coffs Coast now (in Autumn) is an excellent time to plant garlic. As garlic is a daylight sensitive plant - forming leaf growth as daylight shortens through autumn into winter and with bulb growth as daylight lengthens in spring and summer. 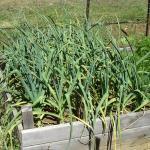 A general rule of thumb with garlic is, plant on short days and harvest on long days. When planting your bulb be mindful to plant so the pointy end is facing up and the clove around two centimetres below the surface and plant 10-15cm apart. Mulch lightly with a loose material like sugar cane or pea straw (although I often find that the pea straw can become problematic when it shoots). Once the garlic has grown a bit, further mulching material can be added. Garlic doesn't like competition, so this is not a set and forget crop - it will need to be weeded frequently, sorry! Garlic will require regular watering and fertilising with seaweed extract to keep the plants growing vigorously until the bulbs start to form in the spring. Once the bulbs have formed pull back on the fertiliser as excessive nitrogen can cause side shoots to form. To harvest garlic - if planted now (in Autumn) you should be harvesting garlic by early summer, it rather depends on the season. However, for a guide when to dig it up is: when most of the green shoots have yellowed but there are still a few greenish ones attached, (and before the stems topple over), dig the garlic up. Some folk like to braid the stems; store in a cool, well-ventilated spot. During the growing season some of the green stems can be cut and used for flavouring. If you wish to learn more about growing garlic in Australia and what types there are visit http://www.australiangarlic.net.au/ you will be blown away by the many different cultivars and groups.